In the picture above, I actually have pizza sauce in the freezer jar. 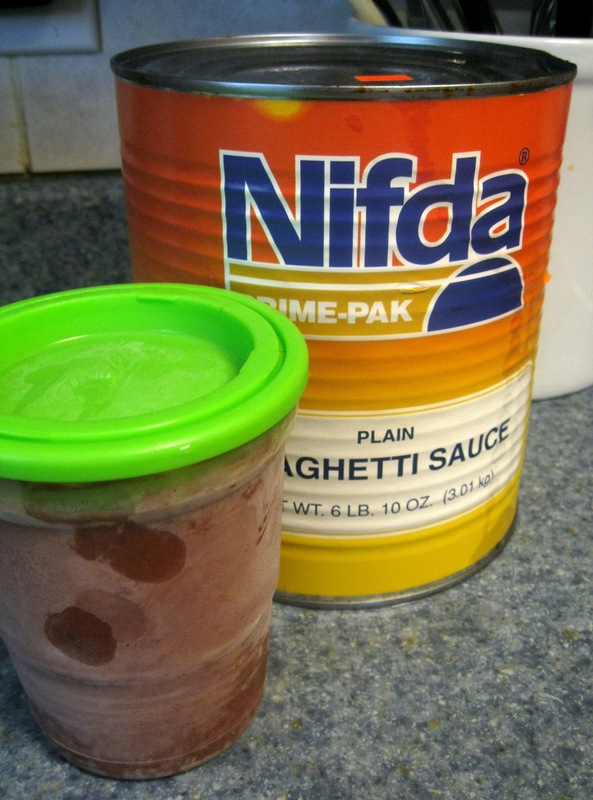 Pizza sauce in the same or slightly smaller sized container at the grocery store for a generic brand costs about $1.00 each. From a #10 can from the wholesale club I can get 6 of these containers for under $3.00 dollars. So that's about 50 cents a jar! In the picture above, you will see a can of spaghetti sauce which I bought to make a large batch of Baked Ziti for a Crowd, but found it for only $2.00! You will find that most items found in the large cans are a cost savings, over their small sized cans. Besides whole sale clubs, many grocery store chains either have a dedicated aisle to #10 cans or they are often found on the bottom shelves. Other places to look are thrift grocery stores which specialize in dented cans and mark downs such as Big Lot and Ollies here in Virginia. 3) Canning jars. Yep. Glass Canning jars. Regular canning jars usually freeze very well and the new boxes at the stores should be marked "freezer safe" right on the box! There is no need to waterbath seal them at all, just pop on a canning lid and ring or Ball makes a new plastic lids for just this purpose in the canning department. remember to leave a little room for expansion, during the freezing process. Almost anything! I prefer to buy in bulk things I use often: such as diced tomatoes, pizza sauce, tomato sauces, Vegetables, and you can freeze fruit, but I don't usually. We eat more fresh fruit then canned, and I'm not sure if the fruit would mush when thawed. I'd love to hear if you freeze fruit! With the vegetables, during the beginning of fall, often I will buy cans of carrots, diced potatoes, corn, green beans etc. and then open them all up and premix them together for a "soup" mix. Then I can just toss one into the crock pot or sauce pan with other ingredients to make things like: vegetable beef soup, taco soup, stew, etc. What do you freeze & what containers do you like best? I freeze loads of fruit from my garden -- lay them on cookie sheets to flash freeze and then put them in freezer bags. They stay separate so I can get out what I need. Blueberries and strawberries do pretty well for eating as is or making a fruit salad, although the strawberries will be softer and juicier than fresh. I also freeze whole fresh figs, bananas, and peach chunks -- good for baking recipes and also smoothies. I also whiz too mushy watermelon and cantaloup and even cucumber in the food processor and freeze the juiced fruit in ice cube trays, to also add to smoothies or to make agua fresca. Diana, I love all the great info! I'm intrigued by the figs! I love the idea of food processing the melons and cukes! Great ideas, feel free to come back and share anytime! Thanks so much! I"ll take a peek over there! Some great ideas - I never thought of lying freezer bags flat dohhh! very clever! i've seen those cans but have never even considered buying them because they are so huge. I just popped over, thanks for the invite! hey. the blog is just awesome to read about. its really interesting and informative. do keep up adding more posts. Ok, you made me smile! Great way to start my day, thank you for taking the time to stop and share with me!